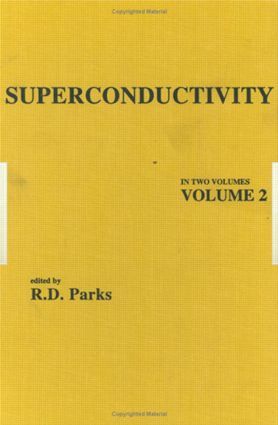 "…this treatise should remain the definitive one on the overall subject of superconductivity for some time. …the level of presentation makes it suitable as a reference for graduate students as well as professional research workers….a 'must' for the library of any organization dealing in any significant way with solid-state physics. We should all be grateful to the editor of his many authors for their labors to bring this treatise to fruition." "As a general reference work for all those engaged in the field the book is an undoubted success." "Early Experiments and Phenomenological Theories, B. S. Chandrasekhar The Theory of Bardeen, Cooper, and Schrieffer, G. Rickayzen Equilibrium Properties: Comparison of Experimental Results with Prediction of the BCS Theory, R. Meservey and B. B. Schwartz Nonequilibrium Properties: Comparison of Experimental Results with Predictions of the BCS Theory, D. M. Ginsberg and L. C. Hebel The Green's Function Method, Vinay Ambegaokar The Ginzburg-Landau Equations and Their Extensions, N. R. Wethamer Collective Modes in Superconductors, Paul C. Martin Macroscopic Quantum Phenomena, James E. Mercereau Weakly Coupled Superconductors, B. D. Josephson The Electron-Phonon Interaction and Strong-Coupling Superconductors, Douglas J. Scalapino Tunneling and Strong-Coupling Superconductivity, W. L. McMillan and J. M. Rowell Superconductivity in Low-Carrier-Density Systems: Degenerate Semiconductors, Marvin L. Cohen Superconductivity in the Transition metals: Theory and Experiment, . Gladstone, M. A. Jensen, and J. R. Schrieffer Theory of Type II Superconductors, Alexander L. Fetter and Pierre C. Hohenberg Type II Superconductors: Experiments, Bernard Serin Boundary Effects and Small Specimens, . P. Burger and D. Saint-James Proximity Effects, G. Deutscher and P. G. de Gennes Gapless Superconductivity, Kazumi Maki Flux Flow and Irreversible Effects, Y. B. Kim and M. J. Stephen A Comparison of the Properties of Superconductors and Superfluid Helium, W. F. Vinen The Intermediate State in Type I Superconductors, . D. Livingston and W. DeSorbo Superconducting Devices, . L. Newhouse Superconductivity in the Past and the Future, P. W. Anderson Appendix: Second Quantization, Vinay Ambegaokar "